At the beginning of the new year I always want to get my life and home organized but I don’t have a lot of money to spend. So I have been looking at ways to organize by using whats around the house. Here are a few ideas that I am looking at. 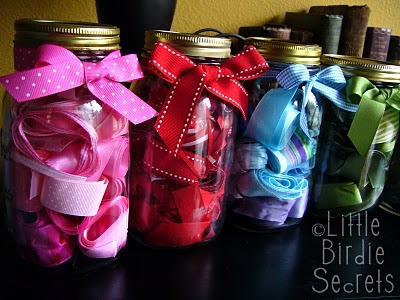 Little Birdie Secrets found a great way to organize ribbons with Jars. And who doesn’t have a ton of jars around the house? 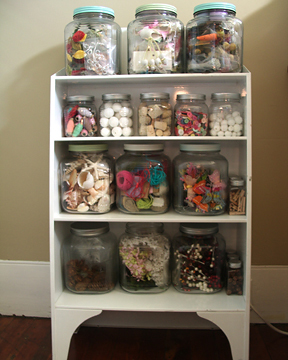 Making Memories Blog also found a nice way to organize with large jars. If you shop at Costco or a large warehouse store you may have some of these around the house. 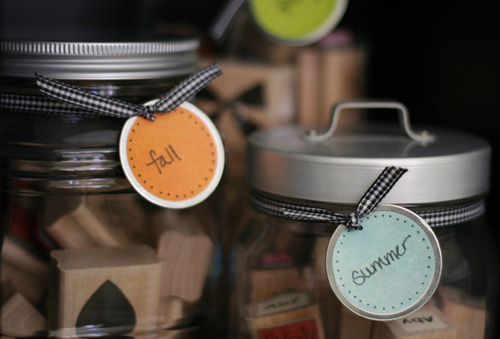 I love these tags on these jars. Aby Garvey from Creative Organizing wrote this guest post on I’m an Organizing Junkie. I hope these ides help you get get excited about organizing your crafts! This entry was posted in Check this out!, DIY, recycle on December 29, 2010 by Deanna.